Salads aren’t just for summer, and I’m here to tell you all about how to make a beautiful, healthy, hearty winter green salad. Yep, you can use seasonal ingredients and make a gorgeous salad even when daylight is in short supply. 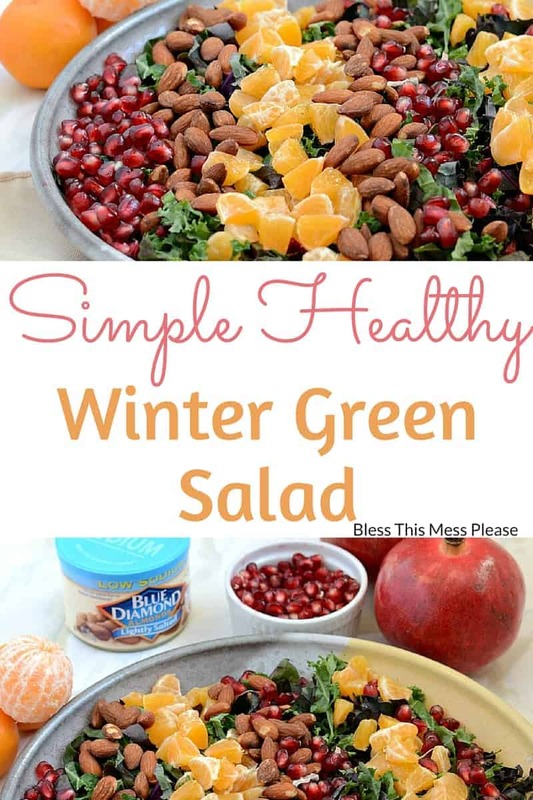 This Simple Hearty Winter Green Salad is the perfect dish to bring to your last parties, dinners, and get-togethers. It’s also going be a big hit in your own home when January rolls around and you are ready to eat your veggies again. The greens. Dark leafy greens are in season right now and it’s a delicious thing. I used Swiss chard, purple and green kale, and baby spinach in this. If you can find the kale and chard small, get that (it’ll come in a bag and might already all be mixed together). Greens are more tender and perfect for salads when the leaves are picked small. You can leave them whole or slice them up a bit. If you can only find the really large leaves of kale and chard that are sold bundled together at the grocery store, that will still work great. Just give the leaves a good washing in cold water and then spin them dry or pat them dry with a clean dish towel. Remove the stems and then thinly slice the large leaves. Slicing the large leaves into thin slices will make them much better for serving them in a salad. I like to chop the stems like you would celery and add them back into the salad. Adding a little spinach will lighten this winter green salad and is a nice addition. The almonds. I used Blue Diamond Lightly Salted (and roasted) almonds for this recipe. I’m working with Blue Diamond today and this salad highlight their delicious almonds perfectly. I eat a lot of almonds and my kids love them as much as I do. Roasting the almonds makes them taste delicious, really brings out the natural sweetness in the nut, and makes them a bit crunchier than raw almonds. I love the little bit of salt that the almonds add to the salad without overpowering anything. A little salty nut here, a strong green there, some sweet fruit here… it’s a lovely blend! Using the whole nut looks fabulous but it also makes for some extra crunch. I loved using Blue Diamond Almonds in today’s recipe. The pomegranates. You can buy whole pomegranates or just the arils, it’s up to you. This is such a fun and pretty seasonal ingredient that you will love adding to your salad. The sweet pops of juicy pomegranate are just plain fun to eat. The mandarin oranges. Mandarin oranges are the seedless, thin-skinned, easy-to-peel little oranges that are in season this time of year. They are perfect for snacking but also make a great ingredient. Their skin is thin, they are easy to peel, the segments come apart nicely… they are just really easy to work with. I just peeled three mandarin oranges, took the orange segments apart, and then sliced each segment into three pieces. Using fresh citrus in a salad looks great and tastes great this time of year. You could add some chopped bacon and/or a little crumbled feta cheese to this salad too. 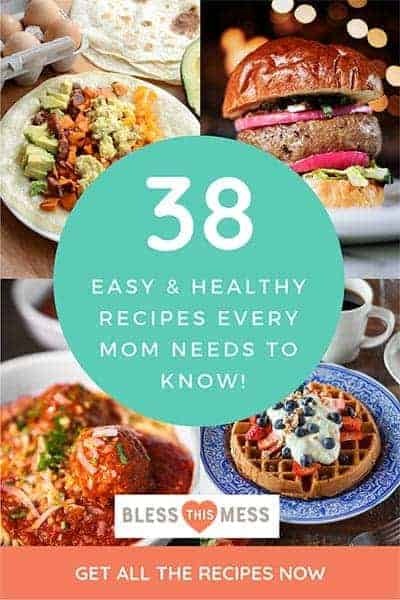 I didn’t because I wanted to keep this recipe vegan/vegetarian, but they would be great additions if you wanted to add them. I’m excited to be working with Blue Diamond today! I have been buying and enjoying their products (almonds and almond milks) for ages. 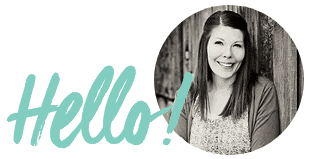 Almond are easy for me to work with and I feel like they are a really natural fit for the blog. I know you all will agree. Have you tried Blue Diamond Oven Roasted Dark Chocolate Almonds yet? I have no idea how they make them but my friend brought me some to try and they are amazing – best sweet snack ever! I’m already planning a “how to make freezer smoothie bags” using their almond milk for January too. Be excited, because you know I am. 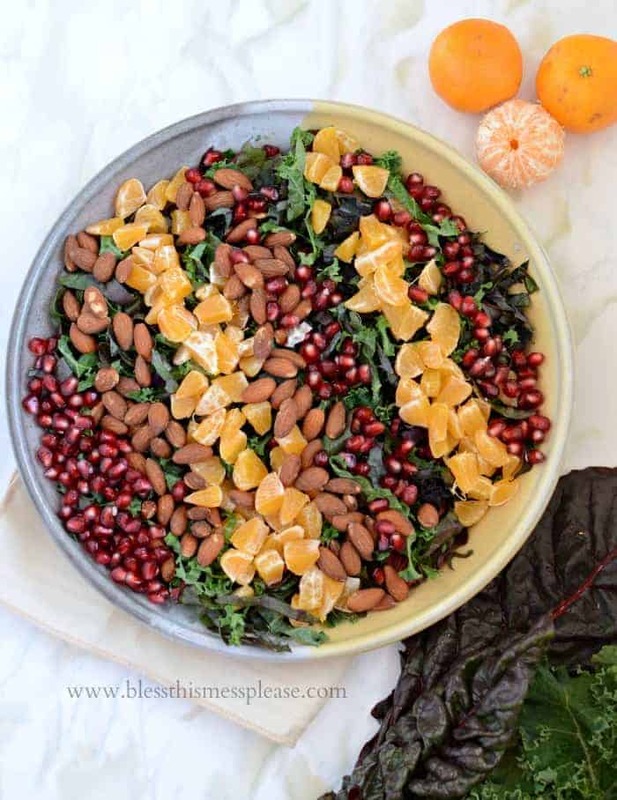 When it comes to dressing for this salad you could make your favorite vinaigrette, whip up the orange juice vinaigrette I recommend (recipe in the notes of the salad recipe), or buy a tasty poppy-seed dressing to go with it. 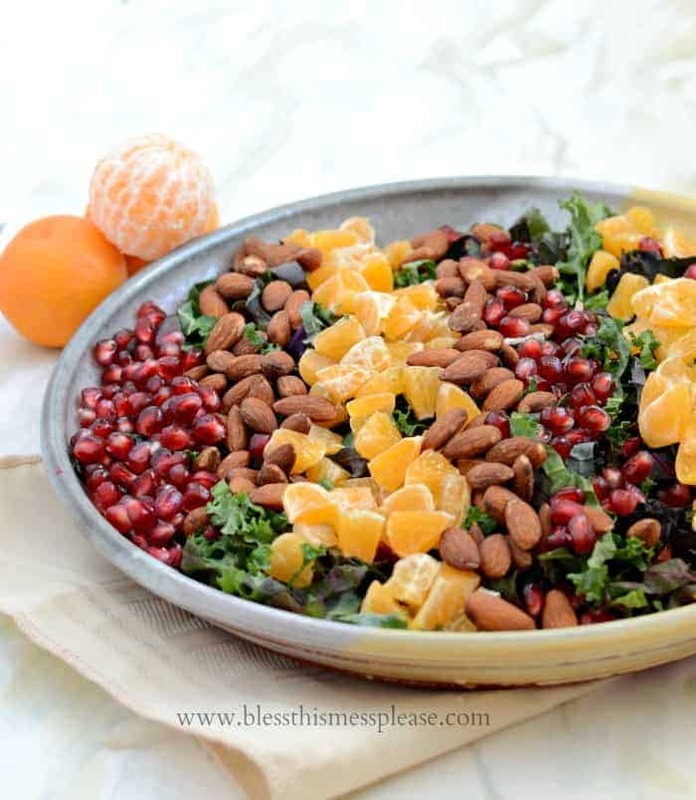 Something a little sweet goes really well with the strong greens and the lightly salted nuts. Add your clean chopped greens to the bottom of a medium serving dish. 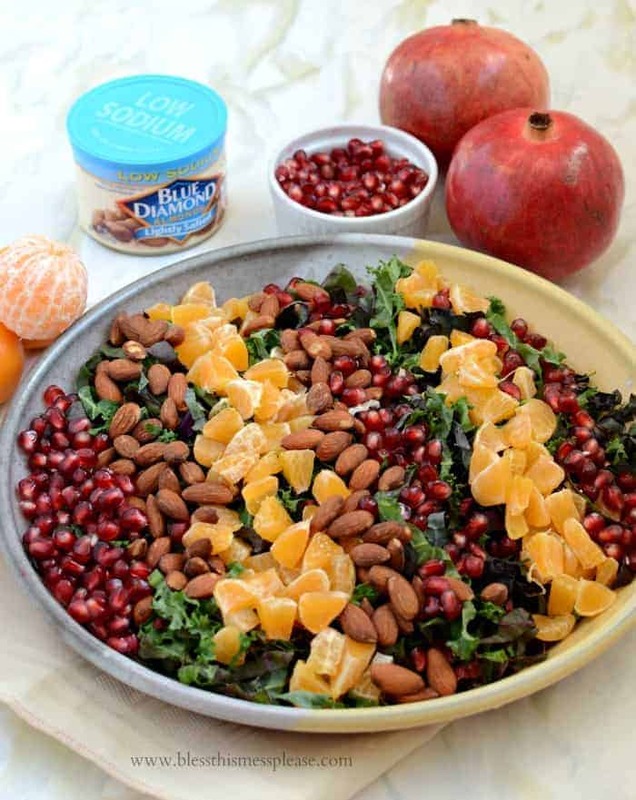 Add the almonds, pomegranate arils, and mandarin orange pieces. Serve with your favorite basic vinaigrette, orange juice vinaigrette, or a poppy seed dressing. If you are using large leaves of kale or chard make sure that you chop them thinly. You want the pieces to be small and tender. Add the lid and give it a shake. Shake well before serving. Delicious, pretty, healthy eating that is perfect for a simple dinner at home or to take to your next party. You are going to love this one! Disclosure: I’m working with Blue Diamond today (and hope to work with them lots more in the future!). They have sent me product to use and have compensated me for my time. All opinions are 100% my own. Thank you for supporting the brands I selectively choose to work with. Nothing personal (I’m contacting all the blogs I follow), but I’m trying to start an at-home business proofreading blog posts. Please let me know if you’re interested. I need it, LOL, but I don’t think I’m organized enough to make it happen! Beautiful dish, and and healthy. Love it.